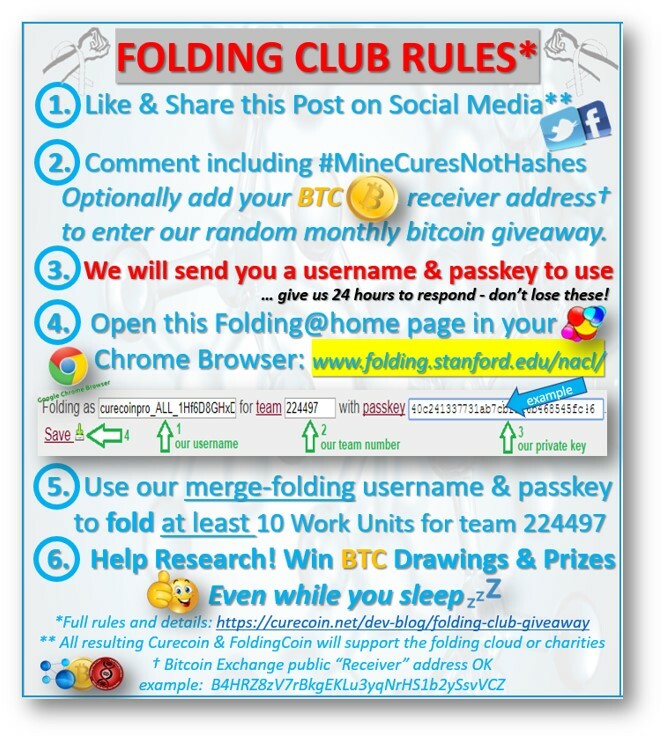 Completed: Folding Club – October 2018 Amazon Smile Gift Card & Random BTC Raffles! 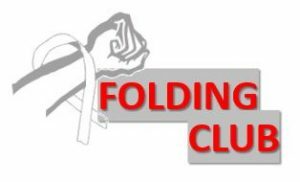 Now Ended: October-November 2018 Folding Club Registration! This months donation target is Somatio Skapaneas. Supporting Employment for the Handicapped People of Cyprus. Optionally, you can discover how Merge-Folding rewards people like YOU with tokens anytime! This months donation targets are Project C.U.R.E. We’re sorry, we could not load Stanford University’s [email protected] in your browser. This [email protected] Web App requires Google Native Client which is provided by the Google Chrome browser. You can check to see if you have version 31 or better by typing chrome://version in to your address bar. 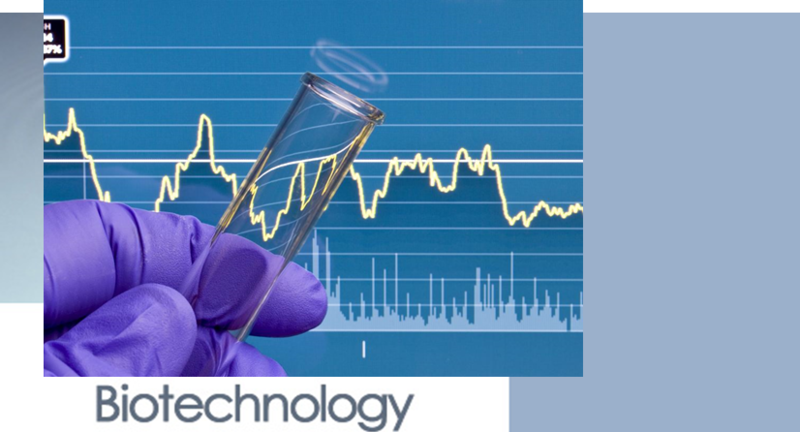 You must be connected to the Internet to run [email protected] Our software downloads problems to work on from scientific institutions around the world and uploads solutions found by your computer which help scientists fight disease. Are you having trouble with Stanford University’s Advanced [email protected] desktop client? 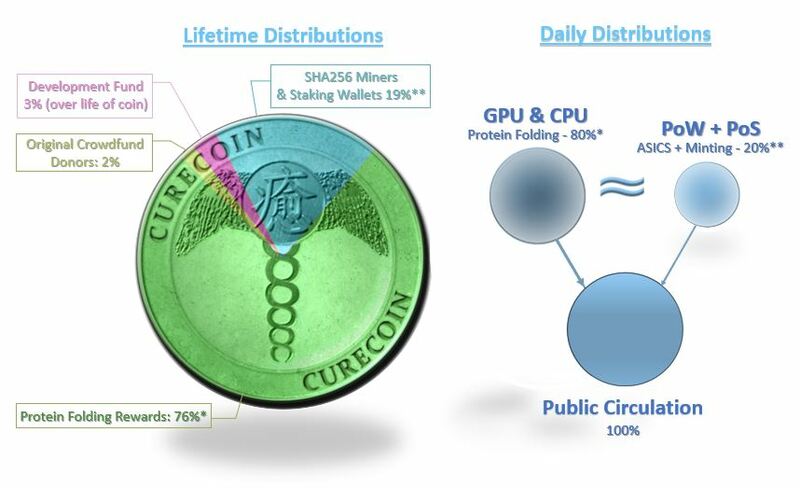 If, in the future, you would like to contribute to Stanford folding research philanthropically, or earn your own Curecoin and Foldingcoin, we recommend you create your own passkey and follow merge folding instructions on either curecoin.net or foldingcoin.net websites. 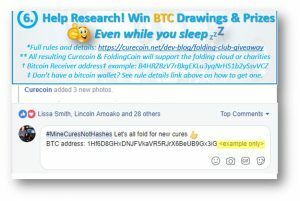 Folding Club – Amazon Smile Gift Cards, eCoupons & Random BTC Raffles! 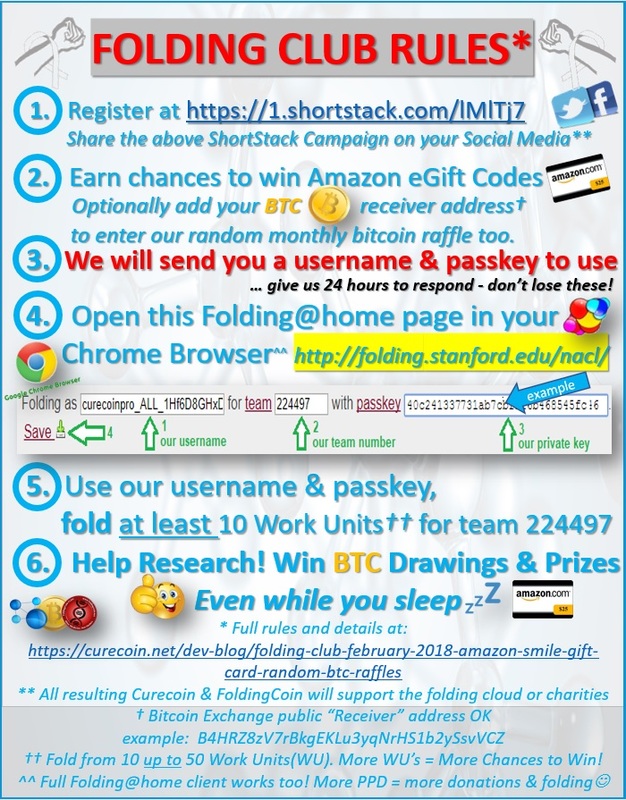 By joining Folding Club, you earn opportunities to win random $100, $80, $60, $40, $20 or $16 prizes (Amazon Smile Gift Code^, Entertainment Coupon Codes, BTC, CURE or FLDC). Optionally you qualify for monthly BTC drawings (minimum prizes start at 0.003 BTC). Follow our Shortstack campaign link to enter by filling out the form simple instructions on the Shortstack Campaign to enter our raffle. Optionally include your bitcoin (BTC) receiver address in the Shortstack registry to enter our monthly BTC drawings. 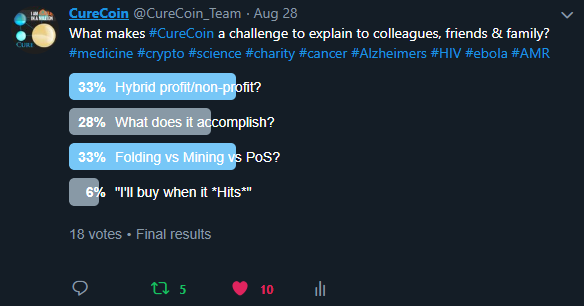 50% of CURE & FLDC tokens we earn collectively as a club help select charities. 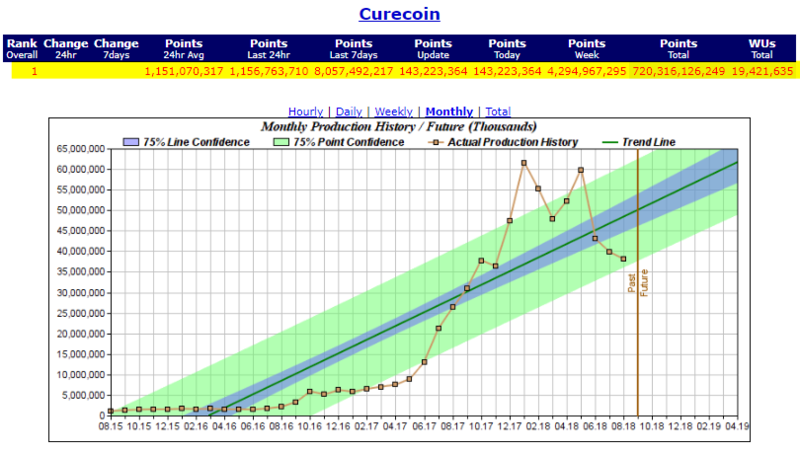 We play 16 numbers, 0.00002 BTC drawings (playing 10 minutes per day on a “best effort” basis). First time users of Google Chrome, may come across an error message. Should that occurs, please follow the instructions on your Chrome browser. Help fund charities around the globe, while your computer helps science – even while you sleep! You CAN make a difference and increase your chance of winning prizes !!! Existing users of the [email protected] software can participate by changing their credentials for a few days. Tested and working on all Google Chrome versions from 31 until 66.0.3359.139. • Los usuarios que utilizan Google Chrome por primera vez pueden encontrarse con un mensaje de error. Si eso ocurre, siga las instrucciones en su navegador Chrome. • Ayude a financiar obras de caridad en todo el mundo, mientras su computadora ayuda a la ciencia, ¡incluso mientras duerme! PUEDES marcar la diferencia y aumentar tus posibilidades de ganar premios! Los usuarios existentes del software Folding @ Home pueden participar cambiando sus credenciales durante unos días. • Probado y trabajando en todas las versiones de Google Chrome desde el 31 hasta el 66.0.3359.139. Öffnen Sie Ihren Google Chrome-Browser und geben Sie die URL http://nacl.foldingathome.org/ ein. • Beim erstmaligen Verwenden von Google Chrome kann eine Fehlermeldung angezeigt werden. Sollte dies der Fall sein, folgen Sie den Anweisungen in Ihrem Chrome-Browser. • Spenden Sie Wohltätigkeitsorganisationen rund um den Globus, während Ihr Computer der Wissenschaft hilft – sogar während Sie schlafen! Sie können einen Unterschied machen und Ihre Chance erhöhen, Preise zu gewinnen !!! Bestehende Benutzer der Folding @ Home-Software können teilnehmen, indem sie ihre Anmeldeinformationen für einige Tage ändern. • Getestet und funktioniert mit allen Google Chrome-Versionen von 31 bis 66.0.3359.139. • قد يتلقى مستخدمو Google Chrome لأول مرة رسالة خطأ. إذا حدث ذلك ، فالرجاء اتباع الإرشادات على متصفح Chrome. • المساعدة في تمويل المؤسسات الخيرية حول العالم ، بينما يساعد الكمبيوتر الخاص بك العلم – حتى أثناء النوم! يمكنك إحداث فرق وزيادة فرصتك في الفوز بجوائز !!! • يمكن للمستخدمين الحاليين لبرنامج Folding @ Home المشاركة عن طريق تغيير بيانات اعتمادهم لبضعة أيام. • تم اختبارها والعمل على جميع إصدارات Google Chrome من 31 إلى 66.0.3359.139. • 간단한 질문에 답하여 복권에 등록하십시오 (click). • 24 시간 이내에 이메일로 개인 패스 키를 받으실 수 있습니다. • Google 크롬 브라우저를 열고 URL http://nacl.foldingathome.org/을 입력하십시오. • 처음으로 Chrome 사용자는 오류 메시지가 표시 될 수 있습니다. 문제가 발생하면 Chrome 브라우저의 안내를 따르세요. • 폴딩 클럽에서 이메일로 보낸 패스 키를 입력하십시오. • 전 세계의 자선 기금을 모금 할 수 있으며 컴퓨터가 과학에 도움이됩니다. 당신은 차이를 만들고 상을받을 기회를 증가시킬 수 있습니다 !!! 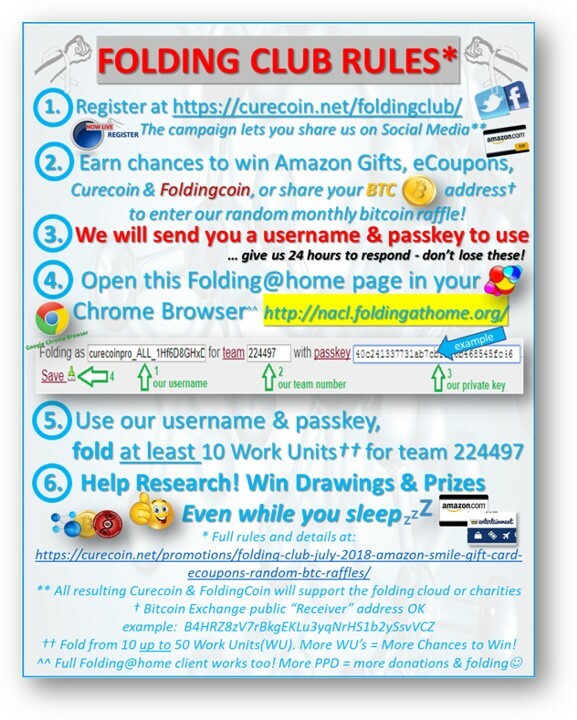 • Folding @ Home 소프트웨어를 사용하는 기존 사용자는 며칠 동안 자격 증명을 변경하여 참가할 수 있습니다. • 31에서 66.0.3359.139까지의 모든 Chrome 버전을 테스트하고 작업했습니다. • दुनिया भर में फंड दान की सहायता करें, जबकि आपका कंप्यूटर विज्ञान में मदद करता है – भले ही आप सोते हों! आप एक अंतर बना सकते हैं और पुरस्कार जीतने का मौका बढ़ा सकते हैं !!! • পৃথিবীব্যাপী তহবিল তহবিল সহায়তা, যখন আপনার কম্পিউটার বিজ্ঞানের সাহায্য করে – এমনকি যখন আপনি ঘুম! আপনি একটি পার্থক্য করতে পারেন এবং পুরস্কার জিতেছে আপনার সুযোগ বৃদ্ধি !!! • Usuários pela primeira vez do Google Chrome, podem encontrar uma mensagem de erro. Caso isso ocorra, siga as instruções no seu navegador Google Chrome. • Ajude a financiar instituições de caridade ao redor do mundo, enquanto seu computador ajuda a ciência – mesmo enquanto você dorme! Você pode fazer a diferença e aumentar sua chance de ganhar prêmios !!! • Usuários existentes do software Folding @ Home podem participar alterando suas credenciais por alguns dias. • Testei e trabalhei em todas as versões do Google Chrome de 31 até 66.0.3359.139. * Les nouveaux utilisateurs de Google Chrome peuvent rencontrer un message d’erreur. Si cela se produit, veuillez suivre les instructions de votre navigateur Chrome. * Aidez à financer des œuvres caritatives à travers le monde, tandis que votre ordinateur aide la science – même pendant votre sommeil! Vous pouvez faire une différence et augmenter vos chances de gagner des prix !!! * Les utilisateurs existants du logiciel Folding @ Home peuvent participer en changeant leurs informations d’identification pendant quelques jours. * Testé et fonctionnant sur toutes les versions de Google Chrome de 31 à 66.0.3359.139. • Впервые пользователи Google Chrome могут столкнуться с сообщением об ошибке. В этом случае следуйте инструкциям в браузере Chrome. • Помогите финансировать благотворительные организации по всему миру, в то время как ваш компьютер помогает науке – даже во время сна! Вы можете изменить ситуацию и увеличить шансы на выигрыш! • Существующие пользователи программного обеспечения Folding @ Home могут участвовать, изменяя свои учетные данные на несколько дней. • Протестировано и работает во всех версиях Google Chrome с 31 до 66.0.3359.139. • ਪਹਿਲੀ ਵਾਰ Google Chrome ਦੇ ਉਪਭੋਗਤਾ, ਇੱਕ ਅਸ਼ੁੱਧੀ ਸੰਦੇਸ਼ ਵਿੱਚ ਆ ਸਕਦੇ ਹਨ. ਜੇ ਅਜਿਹਾ ਹੁੰਦਾ ਹੈ, ਤਾਂ ਕਿਰਪਾ ਕਰਕੇ ਆਪਣੇ Chrome ਬ੍ਰਾਉਜ਼ਰ ਤੇ ਨਿਰਦੇਸ਼ਾਂ ਦਾ ਪਾਲਣ ਕਰੋ. • ਦੁਨੀਆਂ ਭਰ ਵਿੱਚ ਫੰਡਾਂ ਦਾ ਪੈਸਾ ਕਮਾਉਣ ਵਿੱਚ ਮਦਦ ਕਰੋ, ਜਦਕਿ ਤੁਹਾਡਾ ਕੰਪਿਊਟਰ ਵਿਗਿਆਨ ਵਿੱਚ ਮਦਦ ਕਰਦਾ ਹੈ – ਭਾਵੇਂ ਤੁਸੀਂ ਸੌਣ ਵੇਲੇ ਵੀ! ਤੁਸੀਂ ਇੱਕ ਅੰਤਰ ਬਣਾ ਸਕਦੇ ਹੋ ਅਤੇ ਇਨਾਮ ਜਿੱਤਣ ਦੀ ਤੁਹਾਡੀ ਸੰਭਾਵਨਾ ਨੂੰ ਵਧਾ ਸਕਦੇ ਹੋ !!! • ਫਿੰਗਿੰਗ @ ਹੋਮ ਸੌਫਟਵੇਅਰ ਦੇ ਮੌਜੂਦਾ ਯੂਜ਼ਰਜ਼ ਕੁਝ ਦਿਨਾਂ ਲਈ ਆਪਣੀ ਪ੍ਰਮਾਣ-ਪੱਤਰਾਂ ਨੂੰ ਬਦਲ ਕੇ ਹਿੱਸਾ ਲੈ ਸਕਦੇ ਹਨ. • 31 ਤੋਂ 66.0.3359.139 ਤਕ ਸਾਰੇ Google Chrome ਵਰਜਨਾਂ ‘ਤੇ ਜਾਂਚ ਕੀਤੀ ਅਤੇ ਕੰਮ ਕਰ ਰਿਹਾ ਹੈ. • Masu amfani na Google Chrome na farko, na iya zuwa fadin sakon kuskure. Idan wannan ya faru, don Allah bi umarnin akan browser na Chrome. • Taimakon tallafin tallafi a duniya, yayin da kwamfutarka ke taimakawa kimiyya – ko da yayin barci! Za ku iya yin bambanci kuma ku ƙara damarku na cin lambobin yabo !!! • Masu amfani na yanzu na Folding @ Home software zasu iya shiga ta hanyar sauya takardun shaidarka don ‘yan kwanaki. • Yi jarraba da kuma aiki a kan dukan sassan Google Chrome daga 31 zuwa 66.0.3359.139. • Panganggo pisanan Google Chrome, bisa nemokake pesen kesalahan. Apa sing kedadeyan, mangga turuti pandhuan ing browser Chrome. • Bantuan amal dana ing ndonya, nalika komputer mbantu ilmu pengetahuan – sanajan sampeyan lagi turu! Sampeyan bisa nggawe prabédan lan nambah kasempatan kanggo menang hadiah !!! • Panganggo sing ana saiki ing perangkat lunak Folding @ Home bisa melu kanthi ngganti kapercayanane kanggo sawetara dina. • Diuji lan digunakake ing kabeh versi Google Chrome saka 31 nganti 66.0.3359.139. • గూగుల్ క్రోమ్ యొక్క మొట్టమొదటి సారి వినియోగదారులు, ఒక దోష సందేశాన్ని చూడవచ్చు. ఇది సంభవిస్తే, దయచేసి మీ Chrome బ్రౌజర్లో సూచనలను అనుసరించండి. • ప్రపంచవ్యాప్తంగా నిధుల ధార్మిక సహాయం, మీ కంప్యూటర్ సైన్స్కు సహాయపడుతుంది – మీరు నిద్రపోతున్నప్పటికీ! మీరు వ్యత్యాసాన్ని మరియు బహుమతులు గెలుచుకున్న మీ అవకాశం పెంచుతుంది !!! • ఫోల్డింగ్ @ హోమ్ సాఫ్ట్వేర్ యొక్క ప్రస్తుత వినియోగదారులు వారి ఆధారాలను కొన్ని రోజులు మార్చడం ద్వారా పాల్గొనవచ్చు. • అన్ని Google Chrome సంస్కరణలను 31 నుంచి 66.0.3359.139 వరకు పరీక్షించి, పనిచేయడం. • Watumiaji wa kwanza wa Google Chrome, wanaweza kuja na ujumbe wa hitilafu. Iwapo hiyo itatokea, tafadhali fuata maelekezo kwenye kivinjari chako cha Chrome. • Msaada wa misaada ya mfuko duniani kote, wakati kompyuta yako inasaidia sayansi – hata wakati unapolala! Unaweza kufanya tofauti na kuongeza nafasi yako ya kushinda zawadi !!! Watumiaji wa sasa wa programu ya Folding @ Home wanaweza kushiriki kwa kubadili sifa zao kwa siku chache. • Kupimwa na kufanya kazi kwenye matoleo yote ya Google Chrome kutoka 31 hadi 66.0.3359.139.